Home/Brexit/Brexit and the economy: What lies ahead? Brexit and the economy: What lies ahead? Nina Skero, head of macroeconomics at the Centre for Economics and Business Research (CEBR), offers a forecast into the economic impacts of Brexit emanating from a range of scenarios, including a no deal Brexit. Predictive forecasting of the potential economic ramifications of Brexit has become a priority for the CEBR since the 2016 referendum. 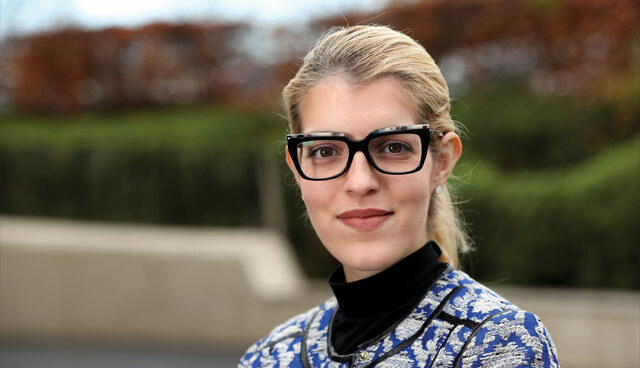 Indeed, when it comes to Brexit, the work of Nina Skero and others at the CEBR has considered many eventualities which may arise following the March deadline, including a fully-negotiated departure, an agreed customs union and the prospect of a no deal departure. Ahead of a forecast for the future, Skero looks at some of the key traits of the UK economy as they are at present. “In terms of GDP growth, we saw a very slow start to 2018,” states the economist, signalling towards figures demonstrating a modest growth of 0.7 per cent between May and August. Whilst some figures can be attributed to one-off occurrences (such as the summer’s heatwave and the World Cup, which saw a rise in entertainment and hospitality-related spending), Skero argues that the overall picture of GDP growth across the year was merely “decent, if not unimpressive”. It is also noted that consumer confidence has witnessed a substantial downturn across 2018: “This has been driven by a negative outlook, especially as consumer and business confidence can often be self-fulfilling prophecies”. Whilst business confidence is also highlighted as demonstrating a substantial decline across the year, Skero is quick to point out that Brexit has not been the sole catalyst behind the decline: global concerns around the US-China trade war and Britain’s ability to forge trade relationships in a world increasingly inhospitable to trade similarly contributed to a subdued impression of economic growth. Like consumer and business confidence, retail sales reflected a downward trend. “This is somewhat unusual, given that wage growth was steady; wage growth and retail sales traditionally move in the same direction,” notes Skero. “I would argue that many households are using those wage gains to pay off debt they have accumulated over recent years, particularly at times of negative or no real wage growth. This feeds into my commentary about the self-prophesising nature of consumer confidence: consumers will look towards the uncertainty of the future and decide that now is the time to pay those debts off before the situation becomes more concerning.” Indeed, whilst total lending and inflation may be seen to be improving, consumer credit has been on a steady decline a fact Skero attributes to lowered consumer confidence and a growing accumulation of debt. Skero concludes her analysis of the country’s current economic performance, placing the UK at a modest starting point for its departure from the European Union. A forecast for the future follows, which the economist divides into three subcategories, depending on the nature of their outcome (central, downside and upside). “Central refers to an outcome in which a free trade agreement between the UK and the EU is secured. A downside scenario would see the UK ‘crash out’ of the EU based on a no deal Brexit. Our upside scenario sees a Customs Union between the UK and the EU, which would cover the trade of both goods and services,” she explains, offering a forecast of some key macroeconomic variables: GDP growth, consumer spending, business investment, average nominal earnings and the euro-sterling exchange rate. “Based upon a ‘central’ outcome forecasted by the CEBR, GDP growth is shown to slow down towards 2019, before experiencing a slight boost in 2020 and for two years after that. We expect much of this to be ‘catch-up’ growth, with many postponed investment decisions and house purchases released following 2019. That is, of course, based upon the outcome of a Brexit deal,” says Skero. “In the upside scenario, we see a similar path, albeit with some more exaggerated upward swings. “The downside scenario in this case is more drastic. We already saw some of this following the referendum, with the depreciation of the pound leading to higher inflation. We would expect this to happen again if Brexit goes badly, having a knock-on impact on consumer spending. 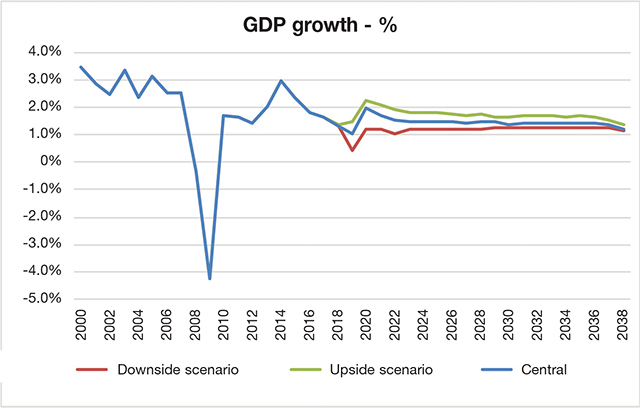 “The central and upside scenarios present a slightly more positive picture in terms of consumer expenditure, although not as positive as it was prior to the referendum, and in the previous 10 years. This is because wage growth has been more subdued than in comparison to previous decades. This can be explained by households not having as much money, and their being faced with increasingly difficult spending decisions,” she claims. “There will certainly be a sharper appreciation if the UK agrees to a Brexit deal with the EU. In fact, the mere hope of a deal recently saw the pound slightly strengthen. In the event of a no deal scenario, we would expect a sharper depreciation of the pound, compared to what we have seen so far, before a gradual recovery over several years. “Reading stories such as that of the ‘Brexit flotilla’ cause businesses to worry, and we are already seeing businesses starting to stockpile. Whilst much of the focus has been on the likes of food and medicine, more than a third of UK imports from the EU were raw materials and semi-manufacturers. So, whilst we may be comforted by GDP growth, we should take account of these influences when putting numbers together. This is essentially artificial growth, as it is activity being borrowed from next year. “Since the referendum’s result was announced, businesses have been asking themselves what contingency actions they can take. And following these measures through may create a false image of robust GDP growth. This is why we should always carefully examine the figures that we are presented with in regard to economic growth, especially when we’re using traditional methods of measurement in unprecedented and chaotic times,” concludes Skero.